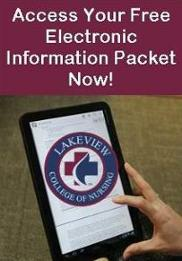 Lakeview College of Nursing is committed to the goal of achieving equal employment, educational opportunities and full participation for persons with disabilities. Therefore, no qualified individual shall be excluded from participation in, denied benefits of, or otherwise be discriminated against in employment, admission, or any activity, or program on this campus. Once a student is attending college, he/she is expected to self-advocate, therefore it is up to the individual to disclose a disability and request academic accommodations. This process is done on a case to case basis and is collaborative. A student may start the process by contacting Vicky Welge at 217-709-0939. Complete an interview with Vicky Welge to determine if, your medical or psychiatric condition rises to the legal level of a disability. You can make an appointment by contacting, Vicky Welge at 217-709-0939. Documentation may be required, following the interview, to determine if a requested accommodation is needed and is reasonable. A letter of approval or denial of academic accommodations will be sent to you no less than 10 days from the interview. Submit a request in writing to Vicky Welge at 217-709-0939 for approved academic accommodations. The request must contain the specific accommodations that are to be received in the specific courses. Requests may be emailed to studentsfirst@lakeviewcol.edu. It is recommended that students meet with instructors during scheduled office hours or before/after class time; to introduce yourself as a student who will be receiving academic accommodations. Contact Vicky Welge at 217-709-0939, during the first week of class if for any reason your academic accommodation has not been implemented. Provide documentation from their treating clinician stating the diagnosis (please adhere to information stated above for documentation requirements) to Vicky Welge. Once you received your semester schedule send an email request to Vicky Welge at 217-709-0939, containing the specific academic accommodations and the course or courses that you want them implemented. Include the title, author/editor, and ISBN number for requests for textbooks in alternative format. Continue to engage in self-advocacy by meeting with instructors during their scheduled office hours or after class time. Contact Vicky Welge at 217-709-0939 in the first week of class if for any reason your academic accommodation has not been implemented.